Pool Cleaning Supplies - Chlorine King Pools - Oldsmar, Clearwater, FL. E rik was born in Clearwater, Florida and has been around water his entire life. Throughout his childhood the majority of his free time was spent in a swimming pool whether it was his family's pool or an American Legion pool. Since then he has competed in numerous triathlons where swims have taken place in various bodies of water; such as oceans, rivers, lakes and pools to name a few. He enjoys being around water and the science behind making it as clear as possible. Erik graduated from Warner University in 2008 with his degrees in both Business Management & Business Marketing. He also minored in economics. He understands how business works and has implemented his knowledge by creating Chlorine King Pool Service. Therefore, his main focus is to restore the honesty and integrity in the pool service industry. 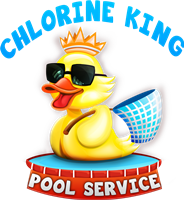 Erik founded Chlorine King Pool Service in 2016. He also acquired his C.P.O. 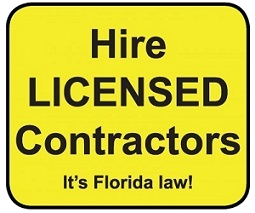 certification in 2016 and earned his State of Florida Certified Pool and Spa Contractor License, CPC1458983, in 2017. If you would like to contact him please send him an email. Brother-In-Law to Erik, Jim has a real passion for helping people and can relate to anyone. Throughout the years he has headed several groups created to help people succeed in life. He believes in people and enjoys making people happy. Prior to Chlorine King, Jim worked in landscaping where he trimmed trees and manicured lawns. He understands the detail and thoroughness needed to complete the job for clients. 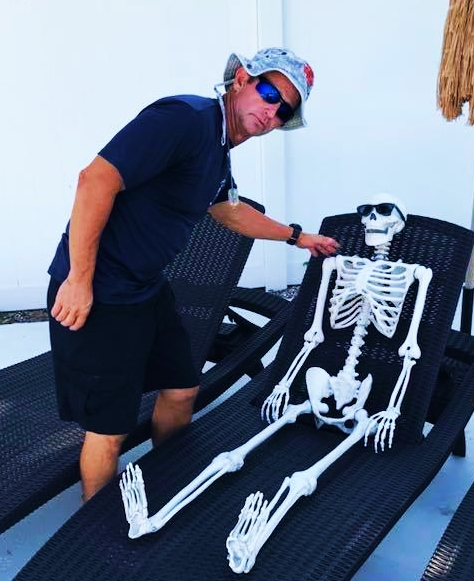 Jim started working for Chlorine King in 2017 and is a strong asset for Chlorine King Pool Service. When he comes to your pool you'll know that you are in the best of hands. He's dedicated, thorough and takes the time to do whatever needs to be done to make sure your pool is cleaned right. Savannah is Erik's wife. Growing up Savannah was always ahead of her class. She was determined to be the very best at whatever she does. She excels in anything she puts her mind to. Savannah had a very fruitful gymnastics career as a junior, but her passion was hospitality. She graduated high school one year early. In 2006 she graduated from Jefferson High School. Just two years later, in 2008, She earned her bachelors in Sports Entertainment & Event Management. Especially noteworthy, in 2010 she earned her Masters in Hospitality Marketing. As a result, she is now applying all of her knowledge to help make Chlorine King Pool service a successful company. She excels in customer relations and will be happy to take care of any need for you. Driven Power Systems was founded by James E. Webb IV, who was born and raised in the Tampa Bay Area. He comes from a family of entrepreneurs and small business owners who set foot in this great country over 4 generations ago. James is now honored to continue this tradition and the result is Driven Power Systems, his rapidly growing electrical contracting business. Driven Power Systems and Chlorine King Pool Service share the same desire for excellent and prompt customer service! He has a passion for the electrical trade and has been in the industry for over 20 years. He has traveled around the country working on projects ranging from residential properties to industrial power plants. The DPS family shares the dedication to building relationships with our customers and other local tradesman. We could list the typical "cookie cutter" reasons other companies do that are over promised and rarely kept. Below you'll find real reasons why we are a splash (more like a tidal wave) above the rest! Unfortunately, there is not a requirement for a residential pool company to be insured (unless licensed). We use SPPA and they are A+ Rated! Google "popped pools" and see why insurance is so important. For instance, most companies do not pay for the extra coverage in the event of a "popped pool." What does that mean for you? Essentially, the cost of a new pool and a company that gets to walk away. Do not take a chance with an uninsured company. We have the insurance to protect all parties concerned! View our insurance here! NSPF CPO Certified: This certification provides us the ability to service commercial pools. The scary fact is there are not any required certifications to service residential pools. Why take a chance with something as valuable as your pool? Make sure the company you choose is CPO certified so your pool will be taken care of correctly to ensure healthy water. View our CPO certification here! 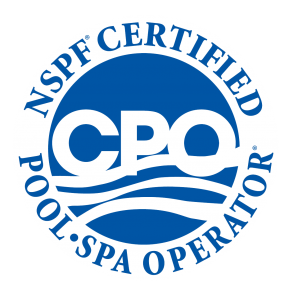 NSPF CPI Certified: This certification ensures the company you choose will do a thorough and quality inspection for your pool. You should know everything about the condition of the pool and it's equipment when buying a home. Why risk it? Let us help your pool buying experience be worry free! View our CPI certification here! Jack's Magic Stain Specialist Certified: Chlorine King Pool Service is a Jack's Magic certified stain specialist! Jack's Magic is renown for stain identification and removal products. Each stain requires a different treatment process to get rid of it. Don't let just anyone come treat your stains. Exposing your surface to certain chemicals while treating stains can create completely different stains! Don't take that chance! View our CSS certification here! 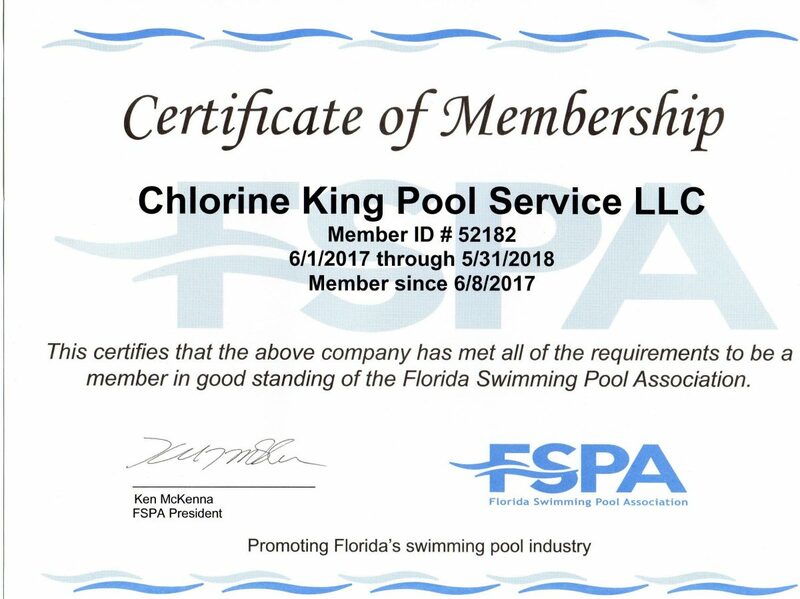 Chlorine King Pool Service is happy to be a member of the Florida Swimming Pool Association! There are strict requirements for an applicant to be granted membership and we are certainly glad we met them. Not just anybody can be a member due to exclusivity, but we are! View our membership here! We know you won't always be home when we come to service your pool. Rest assured that once we leave you will be emailed a summary of the work done along with a time stamped photo of your clean pool. Have peace of mind you are getting what you're paying for but more importantly knowing exactly what is going on with your pool at all times! Be in the know! Contact us and we'll be happy to forward you a sample of the report you'll receive each week. Not being able to get a hold of your pool company when you need them is terribly frustrating. We always tell our customers the only time we will not answer the phone is when we're sleeping. In the rare event we do not answer you instantly, you will hear from us in under an hour when a message is left. That is the Chlorine King difference! View our contact information here!